A pamphlet in Russian entitled “Осторожно, Кипр!” (Beware of Cyprus!) is being handed out at the Sheremetyevo International Airport in Moscow warning Russians not to buy property on the island. RUSSIANS flying to Cyprus from Moscow’s Sheremetyevo International Airport are being warned not to buy property on the island according to an article (in Russian) on the Federal Complaints website. 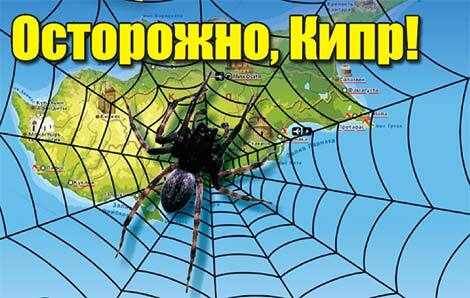 The warning comes in the form of leaflet being handed to travellers entitled “Осторожно, Кипр!” (Beware of Cyprus!). It tells the story of a young Russian couple who were allegedly caught up in a web of deceit involving a mature Russian woman from Moscow and a local developer while they were honeymooning in Cyprus. The Russian woman apparently introduced herself to the young couple and eventually persuaded them to inspect a number of apartments after which they were introduced to the property developer. What followed was typical of what has happened to many others who have bought property in Cyprus. Although the couple were very sceptical to begin with, they were eventually persuaded to buy an apartment after being told that the developer in question was the “most honest of Cyprus” and that there was a queue of tenants lining up who were willing to pay €1,000 a month rent for the apartments once they had been completed. The contract was signed in the developer’s office. The husband attempted to exercise a degree of caution by getting the contract read to him by an interpreter. But the developer stepped in and assured the couple that many Russians had purchased properties from his company without any problems. Unfortunately as a result of the stress and anguish caused, the article reports that the couple have now divorced and the husband has lost his job after suffering a nervous breakdown. A group of lawyers is gathering information about the activities this developer that will enable a class action lawsuit to be filed with the International Court of Justice in The Hague and to provide the law enforcement agencies in Cyprus and Russia with sufficient material initiate criminal proceedings. Remarkable. Halleluyah! Even the Russians are making their citizens aware that the Greek Cypriots will cheat them out of their investment in a home on the island. Surely the cheating developers and bankers might become soul-mates of the renown Leon Trotsky, after they do their regular trick with those elusive title deeds. No More Heroes, great song, great lyrics. Sometimes fair, sometimes appropriate. Unless prosecutions are brought Cyprus will forever have the reputation of a corrupt state. Only time well tell whether the EU and, ultimately, Cyprus want to make the painful but vital change. Having translated the original piece my understanding is that they were talked in to buying a “hotel apartment”. Whilst not unusual, you can even buy cabins on board a ship, this is a very specialised and complicated “purchase”. If this is the case the advising lawyer has a lot to answer for but as we all know will not. @Robert Briggs – I suggest you click on one of the links provided in the article. This will take you to the original article, which in Russian. The name of the developer is immediately apparent (in English) and then you can use Google Translate to get the names of the other people involved. The developer, the solicitors & the sales agent/s involved, conniving in this disgrace. What is the names and their companies? R.B. @All – On legal advice, any comments containing the names of the individuals or companies referred in the article will either (a) not be published or (b) edited to remove their names. PLEASE DO NOT make unsubstantiated comments about any of the individuals or companies referred to in this or the Russian language article. Until such time as this matter has been resolved in a court of law, these are accusations and as such labelling any of the individuals or companies involved as crooks is libellous. Met them all here in Cyprus, dangerous territory. The combination of some developers, some agents, some lawyers and all banks have destroyed any credibility and prospects Cyprus had. Disturbing to see these demons are spreading their deceit and greed to the Russian buyers, the only people adding value to the economy now. I have dealt with a few Russians both directly and indirectly, very good people to deal with, suspicious but very honest if they trust you. They like to deal with the big guns surrounded by glitz and glam but all that glitter is not gold. It’s a hard and expensive lesson to learn, I have been there for several â‚¬100k over the years, I suppose with experience you learn who to trust, but it all hurts. It will be very interesting to see where these pillar developers are when the troika arrive and insist the banks admit and clean up their exposure to developer loans….they will all be in for a rude awakening very soon. From what I understand the website is not government-related, it is called “Federal Complaints” in the sense that it registers complaints from all across Russia. In any case, references to that story are now making rounds in Russian Facebook, blogs, forums etc. Yes- the word is getting around. I understand this week that our comrades have said Nyet to the â‚¬5bn loan. The Troika seem to be putting the wind up Cypriots with their recommendations. These developers and their cohorts have no shame! And the more people who are told about these conmen – and women – the better, there must have been a ‘complaint’ Lawyer involved too! Pleased to see that Cyprus has adopted the EU Anti-Discrimination Directive since joining the EU and Russians are not excluded from being ripped off too!! How much will it take to get the Cypriot developers realise this corruption and scamming must stop? They are bleeding the holiday makers dry, we that have loved that island and helped its economy , but no more! STAY CLEAR OF THESE HORRIBLE , corrupt, heartless people. @Nigel.Why did you remove the developer’s name from my earlier post? The name is plastered all over the Russian website entry. We are not necessarily accepting that the allegations are true, only reporting what this Federal Complaint Register has alleged. Anyone who wants to know who the developer is need only click on the website link on Nigel’s article (the developer’s name is cited in English, together with photos of him and his Russian saleswoman and a large dossier in Russian of the developer’s operations and what the complaint is about). There is also a copy of the warning leaflet that Nigel refers to. So our newest and bestest friends have also grown wise to our special ways have they! I have sat in a hotel in Cyprus overhearing an ‘agent’ telling a couple that they could recoup most of their annual mortgage payments in rental income over the summer. (I had the impression they were on an inspection trip). My wife would not let me interfere. I have been told the same in a Hotel in UK where a Cypriot developer was plying his wares and we happened to be having a weekend break. When I asked the young man handing me the bulls**t, in ladle fulls, if he was on drugs it had no effect at all, he just carried on with his memorised script. Mrs Mike was not impressed. Government must be pooing their rompers trying to figure out who they can prostitute themselves to next. Perhaps they could see if Turkey would be willing to invest in Cypriot property as, in andyp’s words, only Nigeria is left. I wonder if they have tried Venezuela, our Pres must get on well with Pres Chavez, I believe their ideology is quite similar. Let’s see how this unfolds, will they take action ? Mr developer don’t forget to zig zag when you run. Cyprus take immediate decisive action and be seen to do the right thing, it’s your chance for damage control. The stress these despicable people cause is a disgrace and it’s time that governments stopped shilly-shallying around Cypriot sensitivities and came right out and recommended that their citizens do not buy in Cyprus. It was obvious that it would not take long for some corrupt developers and lawyers would get into bed with equally corrupt Russian and started over again now that all the Brits and other EU citizens are on to them. Some developers do not know any other way of doing business, unfortunately it affects the few reputable developers who are just lumped in with the majority which extends all the way up to the (and I will be kind) inept Ministers and other government official who run what could be a beautiful island ! I guess there are similar leaflets at Chinese airports as I have seen no evidence on the ground of these saviours (aka more victims) of the Cyprus property industry. Where to next developers? I could put you all in touch with several Nigerians from whom I have received emails. These guys have billions of euros available to you at no cost. As you are not going to fix the problems surely this must be worth a try. @Nigel. I read the Russian as Federal Complaint Register. Is it in fact a government sponsored website? I note the reference to ‘Operation Quasimodo’ and will be seeking more info from my Russian friends on the actual wording and meaning vis-a-vis the development company and what they are alleged to have done. Unfortunately probably only one of many. It was only a matter of time before Russians were caught. I’m surprised it’s taken this long. Yet another shot in the foot for the reputation of Cyprus. Maybe it will not only be Brits who are saying Dosvedanya to the corrupt world of property sales in Cyprus?